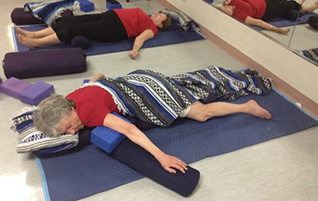 Restorative Yoga is one of yoga master B.K S. Iyengar’s greatest gifts to the world. Restorative Yoga comprises a series of well-supported floor postures on a soft cushioned surface with bolsters and blankets allowing gravity to do the “work”. Deep releases of long-held tension gently expand range-of-motion while practicing “conscious relaxation” for an extended time. You will discover where and how you hold tension. With awareness, willingness, kindness, and patience in a nurturing environment with the leveraging power of group intention, you can learn the primary skill in self-healing, slowing down aging, lowering blood pressure, improving sleep, and revitalizing the immune system. The focus is mind/body/breath effortlessness and ease. You will learn all the basic postures and how to uniquely configure them safely and comfortably to support your body toward harmony and balance. Instruction is compassionate, soothing, personalized and light-hearted. The experience may be nourishing and enlightening in surprising ways. The series allows for progressive relaxation through the eight weeks.. No previous yoga required. Don’t worry…we will make sure to get you safely on and off the floor! Call/text/email Leena to register, today. 925.200.5130, leena@ompeace.com, http://leenastmichael.com. classes, compassion, Restorative, Rossmoor, yoga.